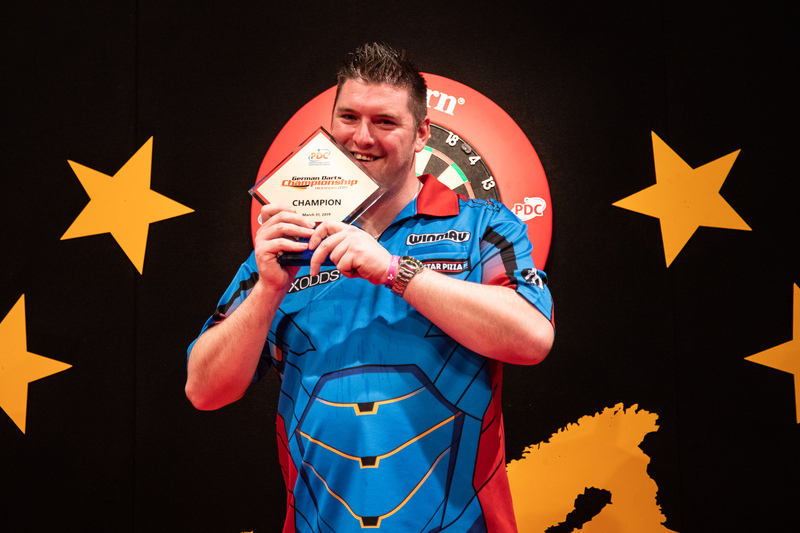 DARYL GURNEY claimed his first European Tour title by defeating Ricky Evans in the final of the German Darts Championship on Sunday. Gurney defeated Rob Cross, Stephen Bunting and Adrian Lewis before edging out Evans in an exciting decider at Halle 39 in Hildesheim. The Northern Irishman, who won the 2018 Players Championship Finals, opened up a 5-1 lead in the final but was pegged back by fast-throwing Evans - who won five of the following six legs to level. Former World Grand Prix champion Gurney closed out the win, however, with finishes of 46 and 96 to add a European Tour triumph to his two televised titles and a Players Championship success. The win moves Gurney up to a career-high third on the PDC Order of Merit, and saw the emotional Northern Irish ace break down in tears on stage as he discussed the inspiration of his late friend Aaron McMenamin. "It's amazing for me to win this title," said Gurney, who returns home to compete in the Unibet Premier League in Belfast on Thursday. "Congratulations to Ricky on his run too. He is a phenomenal player and is so fast he makes me look slow. "My best friend, the person who got me back into darts, passed away a few years ago and I dedicate all of my success to him." Evans reached his second European Tour final by claiming victories against Mervyn King, Darren Webster and Keegan Brown on an thrilling final day of action, which included a nine-darter from James Wade in his last 16 defeat to Webster. "I'm chuffed to bits to have this run," said Evans, who also reached the final of Players Championship Six in February. "I won some great games along the way but the best player won in the final - Daryl deserved it." Brown, who had knocked out number one seed Michael van Gerwen on Saturday, picked up where he left off with a 6-0 whitewash of James Wilson in the last 16 on Sunday afternoon. The former PDC Unicorn World Youth Champion went on to defeat Gerwyn Price in a brilliant quarter-final before falling to a 7-3 defeat at the hands of Evans. Two-time World Champion Lewis was denied the chance to win his second European Tour title after losing 7-5 to Gurney in the last four. Lewis, who recently ended an almost two-year title drought, had earlier averaged 110 in his third round win over Joe Cullen before seeing off Peter Wright 6-2 in the quarter-finals. Having beaten number two seed Ian White in the last 16, Bunting came closest to denying Gurney his glory but lost out in a last-leg decider. Wade produced the second perfect leg of the 2019 European Tour in his third round defeat to Webster, who won the match 6-5. The European Champion fired in two 180s to open the second leg of the clash before finishing 141 to match the achievement of Van Gerwen, who landed a nine-darter in last weekend's European Darts Open. Gurney's success saw him move up to a career-high of third on the PDC Order of Merit, while Brown's run to the last four saw him enter the top 32 for the first time and Evans moved up to 44th with £10,000 prize money.